After all that has been covered regarding the theory of flight, I recall learning in a flight class a point where we had been immersed in the theory of flight for about 4 days straight, all day, only to get to a point where the instructor announced that we needed to forget everything we had learned. A little bit of a shock, but his point was, we were about to learn about supersonic flight, that is, flight faster than the speed of sound, and the rules are completely different than subsonic flight, throw away the notes..... at least until study for exam time!!! The easiest way to explain supersonic flight is to look at what happens to sound when you travel at the same speed, I like to refer to it like the bow wave on a boat, the little bow wave is, at slow speed always in front of the boat, when you go fast enough, you eventually catch up it. It is the same with sound waves, the sound waves travel out in front of you just like a bow wave, even if you think you are being quite, sound waves are emitted from your body as you move through air. Remembering subsonic airflow through a convergent divergent duct as in Bernoulli's theory will adjust before the shape change in the duct, it starts to speed up before the convergence, as if the air anticipates what is coming. Supersonic flow on the other hand has no idea what is coming. If the air is travelling straight and supersonic, and it hits a change in direction due to a wedge being placed in its path, the air must suddenly change direction with it, at the point that the air changes direction it is effectively bending in on itself and therefore compresses as it really has nowhere to go, a shock wave is the result, the compression of air as it changes direction. 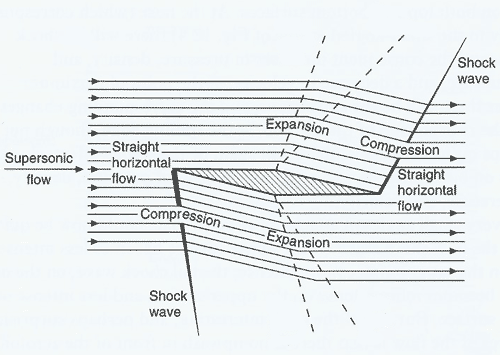 It is important to remember that a shock wave can be a compression type or expansion type, either way a shock wave is formed. The compression shockwave is characterised by a sudden rise in pressure, temperature, density, and a sharp fall in velocity. The expansion shock wave is the opposite, as the shape falls away from the airflow the air must turn to follow it and in doing so travel further, this forms an expansion wave, which has lower temperature, density and pressure, but higher velocity. An aerofoil designed to fly at supersonic speeds will have a double wedge shape as per the picture above, designed to create the right kind of shockwave in the right place, this will cause the high pressure to exist under the wing and the low pressure above the wing, bingo, lift. It is not possible for all aircraft shapes to fly at supersonic speeds, I mentioned in another article that you can't have something for nothing, if you want to fly supersonic you need huge amounts of thrust, the correct size and shape of the wing and fuselage etc. this does not lend itself to high volume passenger flight. Look at the Concorde, a very sleek, long and skinny fuselage with a delta (triangular) shaped wing, a design package that can fly supersonic. You would never get an aircraft like a Boeing 747 or and Airbus A320 going supersonic, if it did it would basically fall apart from the structural stress and the effect the shockwaves would have, including the engines being destroyed as each fan blade will have its own shock wave causing massive stresses that they are not designed for. If you look carefully at the air intake for a supersonic aircraft you will notice the intakes have a deliberate sharp edge at some point inside them. This is designed to deliberately cause a shockwave, which is used for advantage. As mentioned above, some shock waves when formed will contain points of subsonic airflow, the idea here is to use a specific shockwave in the correct place to create subsonic airflow that can safely enter the engine. So having another look at today's general airliner like the Airbus A320, it is designed to fly at subsonic speeds, and does so just under the speed of sound at the point before shock waves will form causing issues, it is their design philosophy to fly at that speed, to go any faster is a whole new design. I hope this sheds some light on supersonic flight, if only the short bare essentials.